This is a North Indian delicacy. 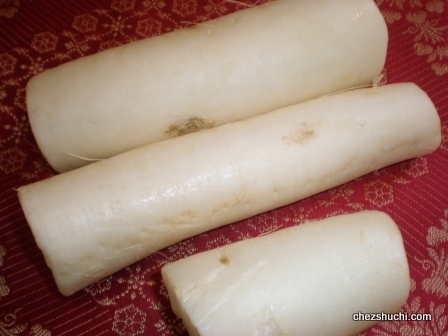 Mooli is known as radish in English. 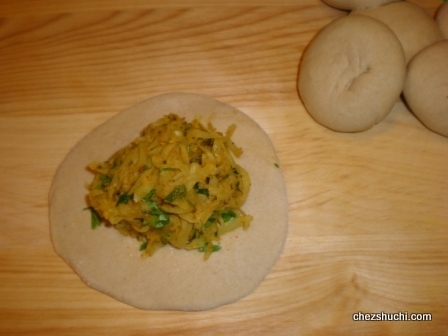 Mooli ka paratha is a pan fried radish/mooli stuffed Indian bread. 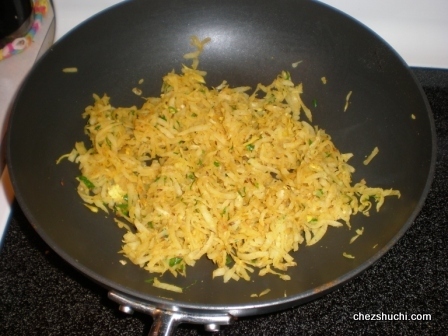 This is a delicious preparation and can be made for breakfast or for meal with yogurt /some curry preparation……. Wash, and remove the thick edges of the radish . Scrap the outer skin of the radish (If you want, peel off the outer skin with a peeler). Now grate the radish. 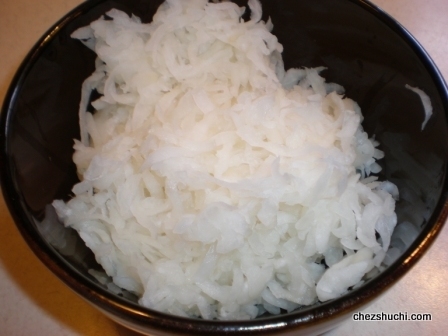 Mix about 1 tea spoon salt in the grated radish and keep aside for 20 minutes. 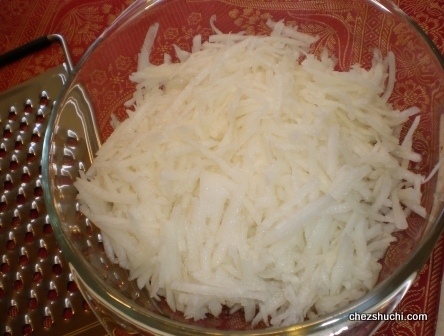 After about 20 minutes grated radish will leave a lot of water. Now squeeze off the extra water from the radish by pressing it in between your palms. Wash, peel off , and grate the ginger. Wash, remove the stem and finely chop the green chilies. In a non stick wok heat oil, add cumin seeds. When seeds crackle, add asafoetida powder. Now add chopped green chilies and ginger and fry for few seconds. Now add radish and all other spices. Mix all the ingredients. Fry until the radish is completely dry. It takes about 5-7 minutes to fry the radish. Add chopped coriander leaves. Turn off the heat and keep the filling aside. We had already added salt in the radish - So it already has salt in it but if you want to add more salt it would be better to taste the radish filling before adding the salt..
Take flour and salt in a big bowl. 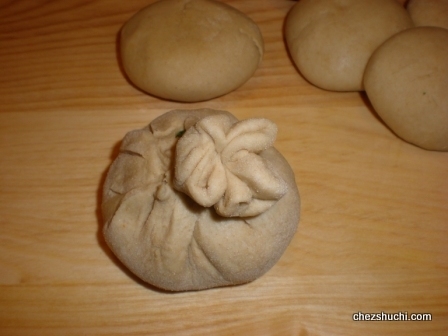 Make a soft dough by adding little water at a time. Cover the dough and leave it for 10-15 minutes. Divide the dough into 8 (eight) portions and make small rounds of these portions. Roll a ball with help of dry flour in about a 3 inch circle. Brush the inner layer with very little oil, and put about one and half tbsp radish stuffing at the center of the rolled ball. Now bring the sides together as shown in the following picture to close the circle. We have to remove the extra dough from the top of the ball . This will help in spreading the filling evenly. Now roll this ball by dusting little dry flour into a 5 inch circle. 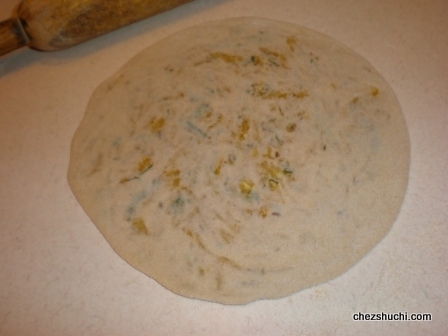 Stuffed parathas are usually rolled thicker than the plain ones. Heat the griddle/ tawa on medium heat. Place the rolled circle to the griddle. Turn it over after about 20 seconds. Now cook from the other side. Brush the top side of the paratha with oil and turn the side. Press the sides with ladle, paratha may puff up. 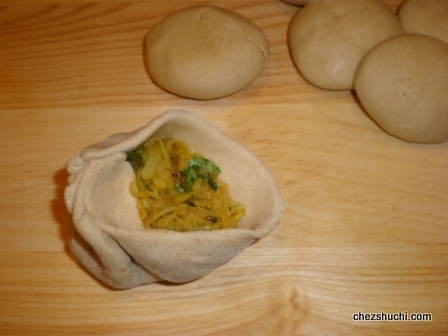 Stuffed parathas also puff up like the plain ones if the filling is dry. So it is ok if they do not puff up. Cook from the other side too. The dough that we have taken out in step 2 can be mixed together to make more paratha ! If the radish filling is already gone make plain paratha. Yummy radish/ mooli Parathas are ready. Serve hot and crisp paratha with plain yogurt/ curd and pickle. You can also serve these paratha with aloo tamatar ka rasa. Butter can be served too with the paratha if you like. 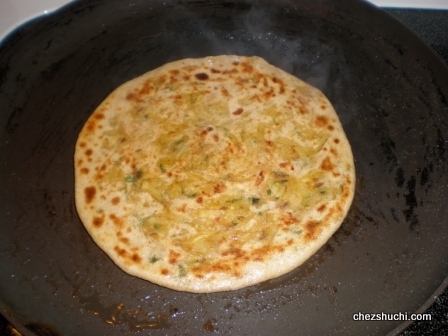 While one paratha is cooking on the griddle you can prepare the other one. And repeat the process. Dough can also be made with milk instead of water. 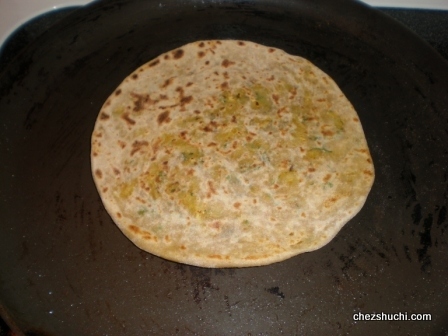 Dry flour to roll the roti or paratha can be stored in a round shape container, if you make them in regular basis.